Getting ink off your hands is surprisingly easy and there are several approaches you can take (depending on what you have lying around the house, that is). The simplest method is scrubbing with soap and cold water for a few minutes, rinsing and repeating until the ink is gone. This can be a tad bit laborious, as the soap doesn’t actively break up the ink on a molecular level. If you’re looking to wash the ink away faster, hand sanitizer contains alcohol, which starts to break up the ink compounds. Another approach involves using ammonia-based glass cleaner. Simply spray glass cleaner on your hands, wait a couple seconds, and then wash them off thoroughly with soap and water. Getting spilled ink out of your clothes is a much more difficult task. Unlike your skin, ink is quickly absorbed into fabric and stubbornly sticks there. If you want any hope of getting the stain out, you have to act quickly before it dries. Once the ink is dried, it’s near impossible to lift out of your garment. Another key thing to remember: use cold water. Warm water will actually push the ink into setting faster. Always use cold water. Step one in dealing with ink on your clothing is diluting the ink with cold water. Dab the spill with a damp paper towel until the ink excess ink stops coming off on the paper towel. Let it air dry for a minute or so. Your next step is trying to release the rest of the ink from your fabric using a solvent that will break up the stain without damaging or bleaching your garment. Rubbing alcohol will dilute and release the ink, as will hairspray in many cases. Damp two paper towels with your solution of choice and sandwich the stain between the two. Start blotting the stain from both sides to lift the ink. As you are pressing, be sure to keep using fresh parts of the paper towel to avoid re-applying the ink you’ve just removed from your shirt. Repeat this cycle a couple times until the ink is gone, then launder the garment per the instructions on the tag, unless of course those instructions suggest using hot or warm water, which will set the remaining ink! Spilling printer ink on your rug presents a unique challenge, but not one that you can’t handle. Your first step is to blot the stain with a damp paper towel, going from the outside of the ink toward the center. Do this until the paper towel is no longer picking up ink when you apply pressure. Take a cotton towel or rag and dampen it with rubbing alcohol. Blot the ink from the outside inward once again to loosen the ink particles from the fibers in your carpet. If this isn’t breaking up the stain, try using hydrogen peroxide. In most cases, if the ink sets at full dilution it will be near impossible to pull up from your carpet, even using professional grade rug shampooers and stain removers. Working quickly to pull up as much ink as you can before it sets is key to avoiding a major mess. One key takeaway from each of these ink spill SNAFUs is the importance of working quickly before the ink sets. For this reason, it’s smart to always have the supplies you need to clean up a major mess on hand and ready to go. Having rubbing alcohol, hydrogen peroxide, and/or clean towels next to you when you replace cartridges will save you from running around hunting for supplies in the event a spill happens. Also, using latex or latex-free disposable gloves when replacing cartridges will help you avoid getting your hands messy. 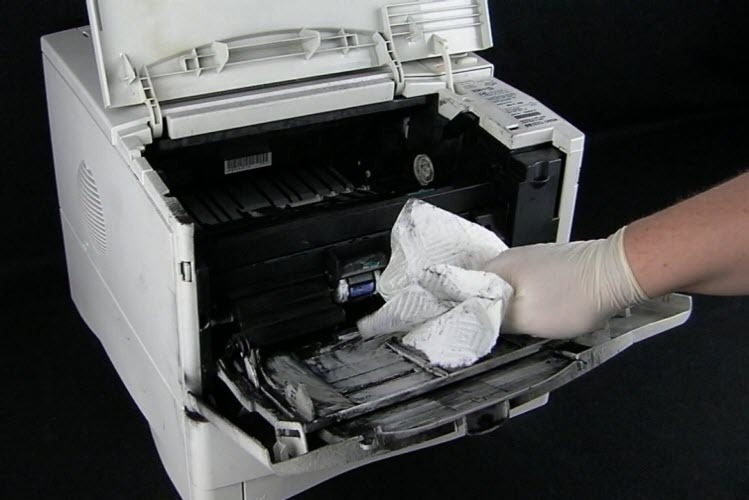 In most situations, ink cartridges won’t leak enough where they will damage anything, but if you are refilling a cartridge yourself or replacing a cartridge that isn’t completely empty, it’s best to be prepared.